THE ABOVE LISTS OF SITES ARE NOT SAFE TO PLAY AT AND SHOULD BE AVOIDED! 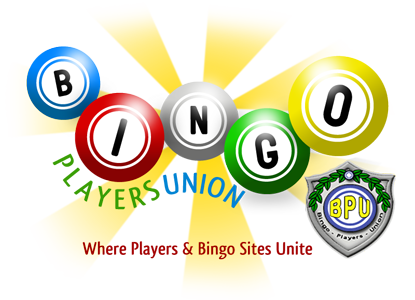 Bingo Players Union is a group of dedicated volunteers aligned with the purpose of creating and maintaining a neutral environment for site owners and managers, players, members and guests to share experiences and information regarding all aspects of the online bingo industry. Our goal is to provide a forum platform to stimulate and promote cooperative effort, assist in resolution, promote unity, fairness, and achieve an acceptable quality of assurance in the non-regulated online gaming entertainment venue for everyone involved. Hi there !!! new joinee... with pandora of Bingo games. Hi jhonnikol15 Welcome to BPU. If you want to know more about the game of bingo, click the link below. NEVER BEEN WON ONCE SINCE IT WAS ADDED ITS GREEN BINGO ROOM ON THE SITE!! BRINGS IN THESE HOUSE PLAYERS TO WIN THE GAMES .. SO THE MONEY GOES BK TO THE SITE..
MONEY U DONATE TO THE SITE.. HOW MUCH TIME U SPEND ON THE SITE ETC.. IF THEY WANT U TO WIN ..
HOW OFTEN ITS GAMES ON THE SITE SAYS INVALID TRANSACTION.. HOW MUCH IT LAGS.. ETC..
WAT OUT FOR CHS CHEATING U ON BBS.. SOME DONT CREDIT THE CORRECT AMOUNT U EARN FROM CG PLAY..ETC.. First off I did thank you....via email I have proff of this...I would never not thank a person who helped me....I can not be mad at you for your honesty and being real. I did this to myself and accept full responsibility for my own actions. As for you I appreciated all your hard work. Sometimes the truth hurts and I can not be mad at you for being truthful im the fool!!!!! Welcome to BPU! If you want to know what is going on in the world of online bingo, Bingo Players Union is a great resource. Players need to inform themselves if they want to be safe playing online. The number of bingo sites that will cheat you is much greater that the ones that are safe to play at. We hope to hear more from you as you become more savvy. Are Mobile Bingo Games require no deposits? I am newbie to mobile bingo games and want to know is any website is who accepts no deposits for playing mobile bingo games. Fast Paying Bingo Site for US player? A fast paying bingo site with no wager rules is Bingomania. I have won a number of times and they never gave a problem paying. If you put a withdrawal in by Sunday 11:59 pm, they will process it on Monday. I usually get the check by Wed or Thurs that week. I actually put in a withdrawal at 11:56pm on a Sunday and had the check on Thursday. It is sent from Canada by Express and you have to sign for it, but I never had a problem depositing it in my bank. They also give good bonuses. I whole heartedly disagree!! I base this on asking myself, when I go to play bingo, am I there to visit or to win? Personally I am there to win! It has nothing to do with community to me. Actually the less that are there, the bigger my chances of winning are. We may be speaking of MANY sides to this coin..... sites allow bonuses to entice players to come and possibly make a deposit someday. But the sites also KNOW these bonus players add to the house edge and build the numbers up so there are more playing who can't withdraw in case of a win, than can. The more bets that are wagered without possibility of withdrawal make up the profit margins of these sites. Please remember, I worked at a couple of sites and saw what was done with the rules to make it harder for ANYONE to withdraw if they won.... always with constant reminders to players to "read the rules". This was GREAT advice because, according to their rules, any site can change the rules when they want. Sure a few win big now and then, but how many do we think that is when based on the THOUSANDS of people who play online bingo???? My opinion... just enough to be free and good advertisements for the sites. Thanks for your question!! By the way, I removed your link until Admin has decided whether to allow or not. With all due respect, we do not advertise free! Is it true that bingo games can be rigged? Yes! Online Bingo Games can be rigged. Not all Bingo Operators do this. If you tell me what site you witnessed this I can give you more details. A good rule here is if you are playing at a Bingo Site and you have a gut feeling something is not right, you most likely are right. Bingo Players Union has invited Paul Marion, the Community Manager of Bingo HQ to provide tips and guidance for players on how to distinguish trusted vs. fishy online bingo sites. Today, whether you play bingo in the US, Canada or the UK, it's important that you're spending money on sites that are trustworthy and that your deposit and time do not go to waste. Thanks to communities like Bingo Players Union, you get an independent group that helps you discover bingo sites that have been carefully reviewed for fairness. 1. Before signing up to the site, check with Bingo Players Union to see if the site is on any black lists. 2. If they're on the Black or Rogue list you should avoid these bingo sites because of past player complaints of unfair gaming practices and poor withdrawal policies. 3. Does the site you're about to join offer huge free bingo bonuses? If so, be sure to carefully review their withdrawal policy as most sites with huge free bonuses have what is known as Bonus Wager Rule requirements. This means, a player must wager x times their bonus received prior to becoming eligible for a payout. The more bonus you get, can work against you if you want to cash out a beautiful bingo prize that you just won. Be always wary of bingo websites with colossal free bonuses because they come with equally high bonus wager rules that make it all harder to cash out your winnings. 4. Does the bingo site have a presence on social communities such as Facebook and t puts customer service as a priority on their list will make it easy for their members to connect with them - Facebook has been a great tool and in a way puts bingo players in control as they have a strong voice to comment, and keep their bingo site accountable on a public forum for all to see. Does the site you're about to join have a transparent and vibrant community on Facebook? 5. Be wary of bingo review comparison sites as not all of them are providing fair reviews. Most bingo reviews that write about a bingo site are not reviews by players but marketers. These sites receive a commission when you sign up and make a deposit at a bingo site that they recommended. Be wary of only positive remarks about a site. No site is perfect - ask friends, consult with bingo review sites that offer true reviews.